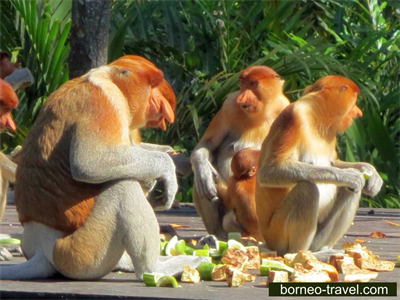 Borneo Travel Ideas to Whet Your Travel Appetite! In beautiful Sabah, Mount Kinabalu is within the Kinabalu Park (see below) which, in turn, is a World Heritage Site. It is the highest mountain peak in Crocker Range (Borneo) and the highest mountain in the Archipelago of Malay (Highest mountain in Malaysia). Travel and adventure seekers take great pride in taking on the challenging hikes but glory in what is an amazing experience, with one of the greatest views you will find in the world – if you can reach the peak! Borneo is lucky enough to have many different national parks and Kinabalu Park is amongst the best. It was designated as a World Heritage Site, Malaysia’s first, in 2000 and in the state of Sabah (northern Borneo). For fresh air, amazing scenery, wildlife and beautiful memories – Kinabalu will not disappoint. You can take one of two amazing trails to the summit of Mount Kinabalu if feeling adventures or just enjoy the natural attractions around Kinabalu Park and meet the people. There are plenty of exciting memories to be made in this amazing and beautiful place, one of many for you Borneo travels. Situated within the Southeast of West Kotawaringin Regency, Indonesia, Tanjung Putting is a national park filled with superb flora and fora but probably most famous for the Orangutan population, an amazing species that is highly protected. The park has lost lots of its primary forest over many years and is undergoing a conservation process with the help of the Friends of National Parks Foundations. Research centres are based within the park to help with the preservation of the wildlife. It truly is a wondrous place to visit. Many take in the peace and tranquillity as well as many excursions available such as boat roads on the river. One of the worlds most complex ecosystems and within the upper reaches of the Segama, Sabah‘s second largest river, Danum Valley has much birdlife amongst the amazing wildlife or the jungle and river areas. There are excellent dishes to taste, something for everyone, and the diversity available within this area is well worth your travel to Borneo and you time. As with many places in Borneo, the people are welcoming and friendly and are sure to make your trip that extra special. Also in Sabah, Malaysia, the Gomantong caves are based in the Gomantong Hills in Sandakan Division. This, again, as one may imagine, is a protected area and especially so for the Orangutans. The caves are home to the wrinkle-lipped free-tailed bats with a colony of over a quarter of a million! The caves are split into two systems, with the Simud Hitam (Black cave) being a little more accessible than the large Simud Putih (White cave). The caves have a certain aroma as one may imagine with all those bats but should be part of any Borneo travellers itinerary if caves are your thing!